An excellent image of a Swedish J8 Gloster Gladiator in the air. Click on the image to see it in full size. The Gloster Gladiator was the RAF's last biplane fighter. The prototype (K5200) first flew in September 1934 designated S.S. 37, and although produced a private venture, conformed to Spec. F.7/30 (to which also the original gull-winged Spitfire had been designed). 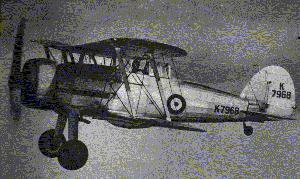 In July 1935 the Gladiator was ordered for the RAF to Spec. 14/35, the initial contracts being for 23 (commencing with K6129). A further 186 (commencing with K7892) were ordered in September 1935 and production continued until 1940. It was produced in three major version; Mk.I, Mk.II and the Sea Gladiator (the difference of the Sea Gladiator being installation of catapult points, a deck-arrester hook and a collapsible dinghy in a fairing beneath the fuselage between the undercarriage legs). Largely replaced in Fighter Command by the outbreak of war, they went to serve with 607 and 615 Squadrons of the AASF (few records survived the German invasion of France but 607 Sq. is thought to have destroyed around 70 enemy aircraft, mostly however with Hurricanes) and equipped one squadron in the Battle of Britain (247 Squadron at Roborough) charged primarily with the local defence of Devonport Dockyards, Plymouth. Most famous is the Gladiator for its exploits overseas, including operations in Norway, Malta and the Western Desert. The Gladiator was also one of Britains biggest export successes before the war, seeing service in many other countries. Engine:________Bristol Mercury VIIIS3 / 840 hsp. The Gloster Gladiator was, as the famous test-pilot Captain Eric M. Brown put it, undoubtedly one of the greatest biplane fighter ever built, but, appearing almost simultaneously with the first of the new breed of heavily armed monoplane fighters and bombers, it was pitched into a combat era where it was outgunned and outperformed, though never outmaneuvered. 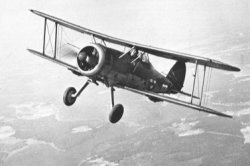 Brown also stated that combat between the Fiat CR.42 Falco and the Gladiator would bee a fascinating duel between the two best biplane fighters in the world. The CR.42 had a slight speed advantage, the Gladiator a slight armament advantage. In the matter of maneuverability the aircraft were about equal, and each was lightweight in construction. A combat between them would be decided on the skills of the opposing pilots. The outcome could go either way.